Obverse: Draped laureate bust of George III right. Reverse: Brittania seated left by seashore, holding olive branch in right hand, trident in left, shield below, sailing ship on horizon at left. KM 662, gilt copper. PCGS PR65 DCAM, cert #29851547. Ex- "ryarmch" (Collectors Universe), 3/4/2014. Purchased in an NGC PR64 CAM holder, #2480028-004. Now that I've gone "eclectic" and am not sticking to any particular set structure (just a "box of twenty"), it was time to find another Soho gilt proof. This British one is a halfpenny, with seated Britannia instead of the Hibernian harp. These scarce Soho mint gilt proofs are hard to beat for "flash". And any 200+ year old proof coin is pretty amazing in its own right, if you think about it. These were at the cutting edge of minting technology in their time. I believe they were made as VIP presentation pieces, and they were originally issued in a metal shell holder which no doubt contributed to to the fine preservation and survival of the coins. With some trepidation, I cracked this piece out of the NGC PR64 CAM holder I'd bought it in, submitted it to PCGS, and held my breath. The outcome made me dance for joy, because not only did I get a one-point upgrade and a TrueView image, but an upgrade from Cameo (CAM) to Deep Cameo (DCAM), as well! And Phil Arnold at PCGS kindly gave me an alternate second TrueView picture for it. 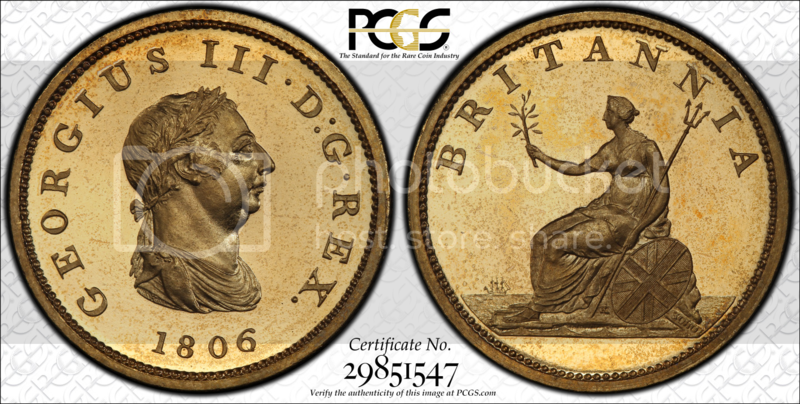 Though I'm a huge fan of the PCGS TrueView photography service, in this particular case the images do not quite do this piece- particularly its deep cameo contrast- full justice. The flashy proof mirrors must have made it a difficult piece to image. This coin is now one of my favorite pieces, and at the time of the PCGS grading in 2015, was the highest graded example and the only DCAM certified, though there is now (as of 11/2016) a single higher example grading PR68 DCAM, which must be a sight for sore eyes!